This is my kind of comfort food – a bit crispy, a bit squidgy and a bit salty. You can keep your macaroni cheese or your rice pudding (well, maybe I’d nick your rice pudding), I’ll have a double wide piece of spinach pie please. 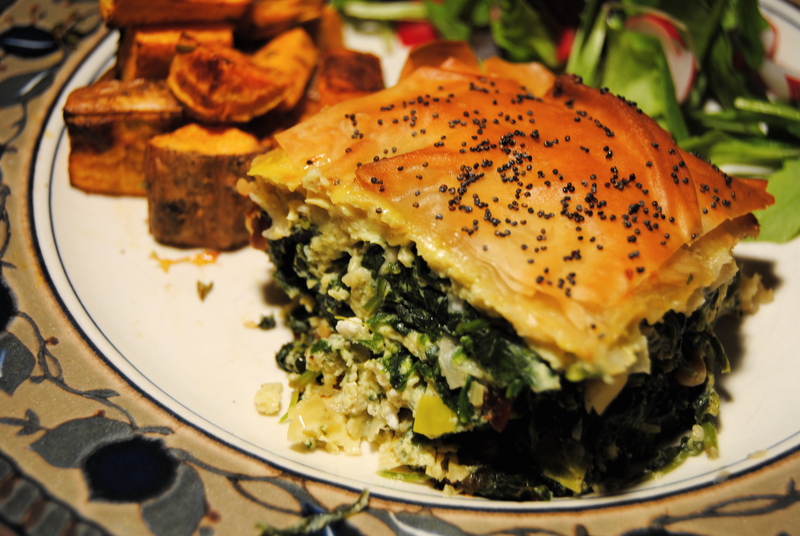 There are plenty of spinach pie recipes out there – Google had 3.5 million, but I didn’t check to see if they were all pies and not pictures of cats or tattoos. You’d be surprised what you see. Anyway, I have served my version of spinach pie for family, friends and at the Edinburgh Maggies Cancer Caring Centre for many years. It’s quite Greek, but with a a little less saturated fat and a lift from the lemon zest and sun-dried tomatoes. I hope you enjoy it. The Science Bit: Spinach is an immensely useful and nutritious vegetable. We can use it in soups, salads, as a side dish, in stir fries, risottos, bakes, pies and juices. It is best raw or very lightly cooked to get the full benefit of its vitamin C and carotenoid content, but their B vitamins (including a good amount of folate), calcium, magnesium, zinc and of course fibre are still mainly intact when cooked. 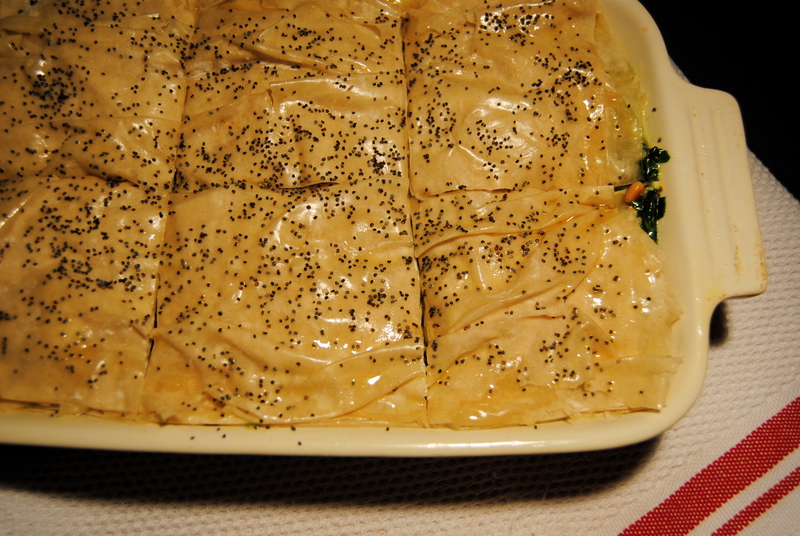 The spinach is minimally cooked in this dish, even taking into account the brief spell in the oven. Spinach and other dark leafy green vegetables contain carcinogen-deactivating antioxidants and carcinogen-binding fibres that may, when eaten regularly, reduce risk of colon cancer, aggressive prostate cancer, and other cancers. This group also supply eye-protecting lutein and zeanthanxin, helping to prevent cataracts from forming. Have spinach with some type of citrus to best absorb its iron and calcium. To find out more about spinach’s health-promoting properties, click here. What You Do: Rinse the spinach and wilt it down in a large lidded pan. I just leave it on a low heat for five minutes, stir, and leave for another two minutes. Drain in a colander, pressing out as much water as you can, then chop and put in a large mixing bowl. 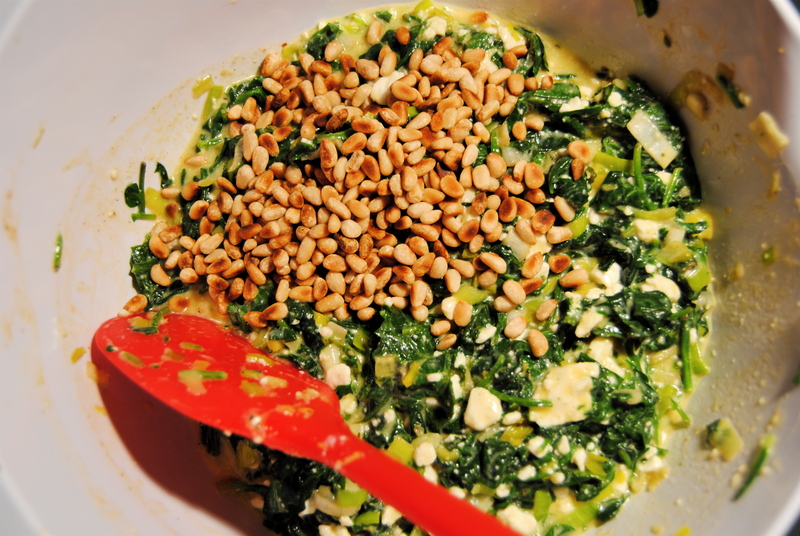 Put the pine nuts in the saute pan and dry toast them until starting to become golden and fragrant. You have to watch them like a hawk as once they heat up they burn very quickly – sometimes you can buy pre-toasted pine nuts. Pop these into the bowl with the spinach. Add the oil to the saute pan and fry the onion on a low heat, stirring frequently, until translucent – about eight minutes. You can also use oil spray or soften in a little vegetable stock only. Leave aside to cool. Once the spinach, onions and nuts are cool enough not to scramble the eggs (!) mix all the filling ingredients together, grating in the zest of the lemon and about 1/8 tsp of fresh nutmeg (about 10 grates worth) and spoon it into your baking dish. Heat the butter in a small pan and brush individual phyllo pastry sheets (I use 4 large sheets, halved to make 8), laying onto the pie filling as you go. Keep the dough pliable by covering with a damp tea towel until you use it. To help with neater slices, allow the pie to cool before scoring it with a sharp knife into serving sizes before baking. Sprinkle the top with poppy seeds. I often try and cut down the fat by buttering every other layer and this works just fine. I find that oil sprays make the pastry soggy, and then what’s the point? While the pie is cooling before I mark out the slices, I use the time to prep my side dishes – making cumin seed-sweet potato wedges to go in the oven with the pie, and sorting another green veg, such as broccoli. * Pan size: Standard rectangular baking tins and dishes are not so standard anymore. I find it easier to go by the volume rather than dimensions. For this recipe I used a ceramic dish with a volume of 1.2 litres, or 38 US fluid ounces. That is equivalent to a 10″ x 7″, or any dish with slightly more width and less length/more length and less width. See how confusing it can be? 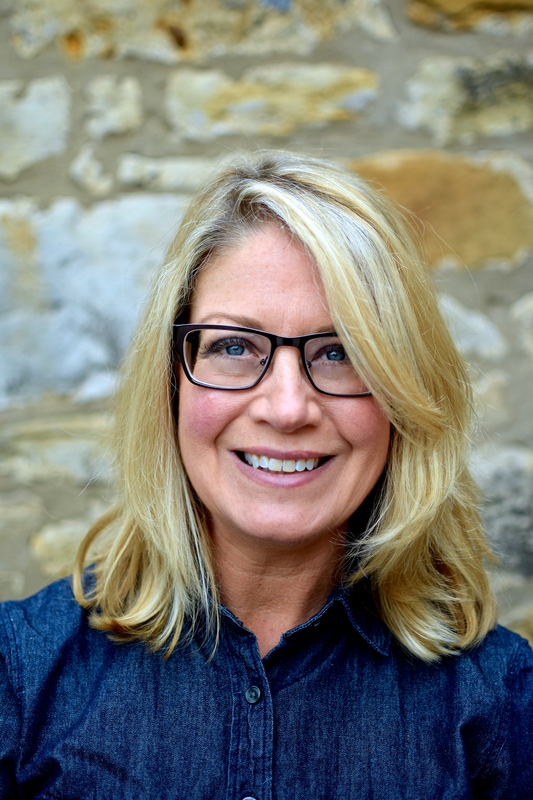 Use volume measures – much easier. For this recipe just make sure that once the filling is in that you have an extra 4 cm/1.5 inches or so for for pastry and rising of the filling. ** Make it vegan: Use one 200/250 g package of firm tofu, zest and juice of the lemon, a few teaspoons of deactivated yeast flakes for a cheesy flavour if you like, a teaspoon of salt and of course leave out the eggs. 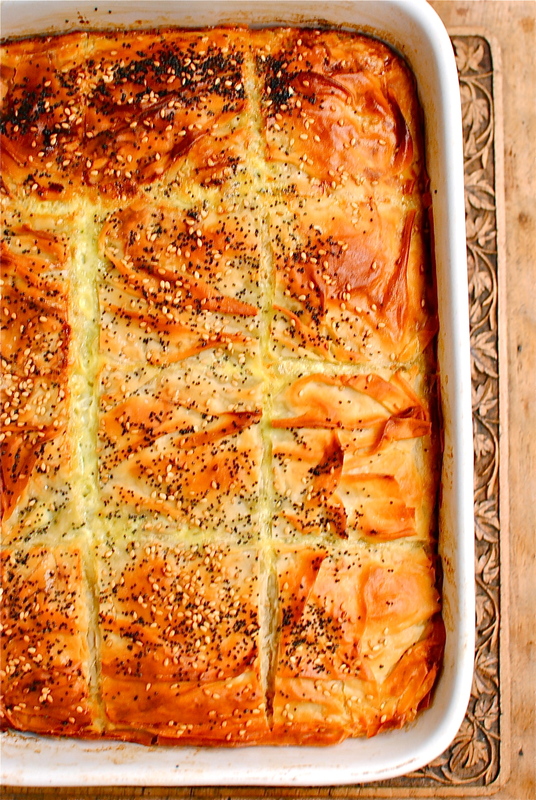 Try vegan margarine or half marg and half olive oil to brush over the phyllo. I haven’t made it this way so I can’t vouch for the taste or technique but it should be pretty tasty and a similar texture to the feta version. Adaptation for soft food diet or swallowing difficulties: Don’t use the sun-dried tomatoes, pine nuts or pastry and make it as a kind of soufflé. Have with well-cooked or pureed carrots and mashed potatoes. Thanks Joanie. It’s really easy and manages to taste fresh even though it’s cooked. Let me know if you try it and how you liked it. I am Kellie’s nephew and I’ve personally had this dish. It was delicious! Thanks Aunt Kellie! Thanks Trippster! I’m posting sushi ideas soon so I want to hear that you and Madison have tried them. Be good! 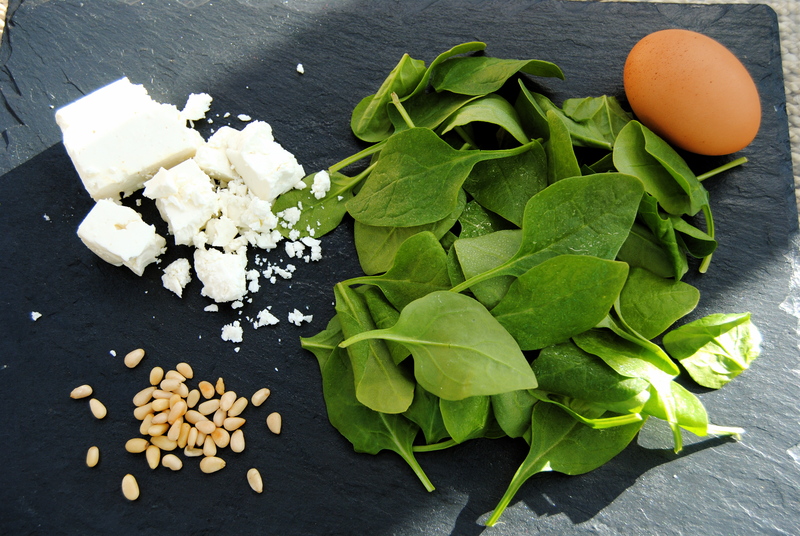 Spinach and feta are perfect partners, aren’t they? Your lasagne sounds good! I’m glad you like the look of it. It’s a family and friend favourite so I hope you or your sis give it a try too. Your whoopie pies look amazing btw! Next time I might fill individual little parcels with the mixture.